This week's Free GM Resource is am interesting minimalist RPG. 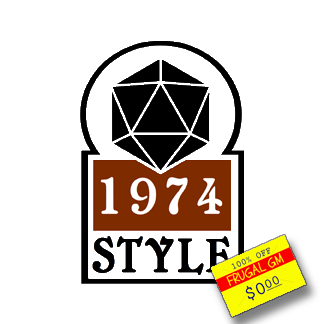 1974 Style Roleplaying Game just about defines the term "minimalist", with the single-source PHB/GMG/MM "book" coming in at a whopping 5 pages. The PC sheet is a staggering 4" x 6". With such a small ruleset you really don't have any problems using this for any genre. Coming from a heavy ruleset background (HackMaster 4th Edition), the 1974 Style Roleplaying Game seems like an odd curiosity that couldn't possibly be worthwhile. Seriously?! What's the point in this game?! Well, after the initial WTF moment wore off I realized that this could really be a perfect GM training tool. With such a rules-light system you really have to "go with the flow" and rely on rulings, not rules. A GM also has to go way beyond simple flavor text spoon-fed from the adventure writer. As somebody who has written (and run) more than a few tournaments, I had learned that I had to go pretty much word-by-word through the adventure's text boxes. If you allowed deviation your players might run rough-shod over the adventure, gaining an unfair advantage, or you might just screw them over in the process.